This section will not only give you some tips on negotiating, but it will show you how to create two opportunities to negotiate down the price of the automobile. If the automobile you've inspected has no major problems (see: Part II, Areas of Special Interest) and you are considering buying it, it's time to enter the first stage of negotiations. When negotiating, you should divide the automobile into two areas. The first area is cosmetics. The second and most important area is its operation. This stage of negotiations deals with the first area, cosmetics. Remember, an automobile depreciates because it has been used. It will show signs of use, but it shouldn't show signs of neglect. Torn seats, rust and dents, stains in the interior and similar damage are signs of neglect and should be considered in this stage of negotiations. 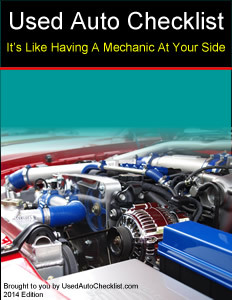 Explain to the seller that you want the automobile but you want to wait for the mechanic's opinion. At this point you'll want to arrive at a price that is dependent on the outcome of the mechanic's inspection. Doing this will keep the price from rising if the automobile is in good mechanical shape. It also gives you a way out if the seller doesn't want to lower the price because of problems with the automobile. If you have done your homework, you will know the average selling price of the automobile (see: Part I, Step 8: The “Blue Book”). When discussing cosmetic problems, don't come on too strong. The main objective is to get the seller in a position of flexibility. If the seller lowers the price a bit because of these cosmetic problems, great. If not, remember them, and use them after you get the mechanic's assessment. In the back of this book is a form for you to use to lock in a provisional price based on a good assessment by your mechanic. You can write in amounts you are comfortable with for instance, $50 for each repair and a total not to exceed $250. Once both you and the seller have signed, the automobile is yours unless the mechanic's estimate doesn't meet the provisions. So make sure you are satisfied with the automobile and price. If the automobile you've inspected has any major body damage of evidence of accident repair, you should consider bringing it to a body shop for an additional estimate for repairs. An important point to remember is, never tell the seller (especially a salesperson) how much you want to spend or how high you want to go on monthly payments. Seemingly unknown to most people, new automobiles are among the most “haggleable” products on the market. This applies even more to used automobiles because of the flexible resale values. To reveal your financial ability gives the seller an advantage. Revealing how much you like the automobile also give the seller an advantage. This is especially true with the professional salesperson. He or she will undoubtedly take advantage of your emotional commitment by using it to convince you to buy the automobile at a higher price (some salespeople are very good at this). If you decide to buy your used automobile at a new car dealership, you will have less room to negotiate. If you go to a used car dealership, your chances of knocking the price down a bit are a lot better. The best chance of doing some major haggling is with the private seller. Keep in mind that the prices advertised in the classifieds are usually inflated. The sellers do this because they expect to have to come down in price. Be prepared to walk away from any negotiations if you are not satisfied. Remember, the seller has a lot more to lose by you walking away than you do. If you don't feel comfortable with negotiating techniques, go to the library or go online and look for books or information on the art of negotiating. The library will also have books written specifically on the topic of negotiating the terms, conditions and price of automobiles. Be prepared to pay $50 - $150 for the mechanic's inspection. If you think that is a lot to pay for a mechanic to inspect the automobile, consider the alternative. Let's say you bought the automobile for for $6000.00 without having a mechanic inspect it. You soon find it has internal engine problems and you have to shovel out another $1000 to get it fixed. You have actually paid $7000.00 for an automobile you could have paid $5000.00 for (it's likely the mechanic would have found the issue and you renegotiated a reduced price or walked away). This is $1000 out of your pocket, not to mention higher sales tax if you bought at a dealership and higher property tax for as long as you own the automobile. Go to a mechanic that you know or a friend recommends. Don't go to the seller's mechanic. If you are away from your or your friends mechanics and you are a AAA member, you can get a list of AAA approved mechanics for the area the automobile is located. Listed on a form in the back of this book are items the mechanic should check. Copy the form and tell the mechanic you want a complete check, including what is on this list. Make sure to point out all the problems you found during your inspection and have the mechanic double-check those items. Have the mechanic write down the results of everything he checked. This will assure you that everything was checked. Get a written estimate for repairs and review it with the mechanic to make sure he covered everything. It is likely the mechanic will find problems allowing you two choices: to do more negotiating with the seller or, walk away from the deal altogether. If the mechanic found problems, don't worry. After negotiating the price, and then using the money you saved for repairs, you shoud have a fine automobile. Note: If you decide not to buy the automobile, the seller may ask you for a copy of the estimate. Since you payed for it, you can choose not to give it to him or her. You might try selling it to recover some of the money you spent. When negotiating, you'll want to get the whole cost of repairs off the price (advertised or a provisional price). It's not likely the seller will do this but if you meet halfway, you've done well. Don't let the seller get away with selling you a used car, truck, van or SUV with problems for the price of an automobile with no problems. When you negotiate for anything, you need to have a little backbone, or at least fake some. The seller will take advantage of you if you don't. Have an attitude of fairness, you'll go a lot farther.